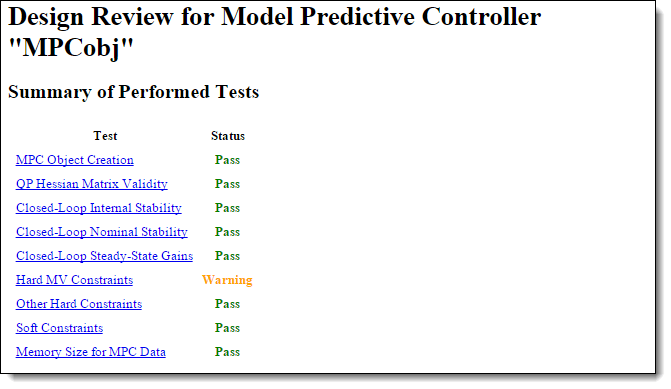 review(mpcobj) checks for potential design issues in the model predictive controller, mpcobj, and generates a testing report. The testing report provides information about each test, highlights test warnings and failures, and suggests possible solutions. For more information on the tests performed by the review function, see Algorithms. results = review(mpcobj) returns the test results and suppresses the testing report. Define a plant model, and create an MPC controller. -->The "PredictionHorizon" property of "mpc" object is empty. Trying PredictionHorizon = 10. -->The "ControlHorizon" property of the "mpc" object is empty. Assuming 2. -->The "Weights.ManipulatedVariables" property of "mpc" object is empty. Assuming default 0.00000. -->The "Weights.ManipulatedVariablesRate" property of "mpc" object is empty. Assuming default 0.10000. -->The "Weights.OutputVariables" property of "mpc" object is empty. Assuming default 1.00000. Set hard upper and lower bounds on the manipulated variable and its rate of change. Review the controller design. The review function generates and opens a report in the Web Browser window. -->Converting the "Model.Plant" property of "mpc" object to state-space. -->Converting model to discrete time. -->Assuming output disturbance added to measured output channel #1 is integrated white noise. -->The "Model.Noise" property of the "mpc" object is empty. Assuming white noise on each measured output channel. review flags a potential constraint conflict that could result if this controller was used to control a real process. To view details about the warning, click Hard MV Constraints. Specify constraints for the controller. Review the controller design, and suppress the testing report. All of the tests passed, except for the the hard MV constraints test, which generated a warning. Create and review designs for gain-scheduled model predictive controllers for two plant operating conditions. Create plant models for each of the two operating conditions. Design an MPC controller for each operating condition. Review the controller designs, and store the test result structures. MPC controller object, specified as an mpc object. For more information on the tests performed by the review function, see Algorithms. The results structure does not contain a field for the Memory Size for MPC Data test. If a given test generates a warning or fails, generate a testing report by calling review without an output argument. The testing report provides details about the warnings and failures, and suggests possible solutions. You can also review your controller design in the MPC Designer app. On the Tuning tab, in the Analysis section, click Review Design. 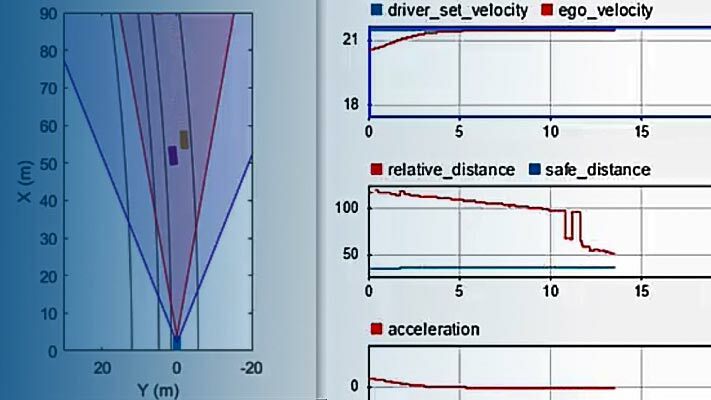 Test your controller design using techniques such as simulations, since review cannot detect all possible performance factors. The review command performs the following tests. MPC Object Creation Test whether the controller specifications generate a valid MPC controller. If the controller is invalid, additional tests are not performed. QP Hessian Matrix Validity Test whether the MPC quadratic programming (QP) problem for the controller has a unique solution. You must choose cost function parameters (penalty weights) and horizons such that the QP Hessian matrix is positive-definite. Closed-Loop Internal Stability Extract the A matrix from the state-space realization of the unconstrained controller, and then calculate its eigenvalues. If the absolute value of each eigenvalue is less than or equal to 1 and the plant is stable, then your feedback system is internally stable. Closed-Loop Nominal Stability Extract the A matrix from the discrete-time state-space realization of the closed-loop system; that is, the plant and controller connected in a feedback configuration. Then calculate the eigenvalues of A. If the absolute value of each eigenvalue is less than or equal to 1, then the nominal (unconstrained) system is stable. Closed-Loop Steady-State Gains Test whether the controller forces all controlled output variables to their targets at steady state in the absence of constraints. Hard MV Constraints Test whether the controller has hard constraints on both a manipulated variable and its rate of change, and if so, whether these constraints may conflict at run time. Other Hard Constraints Test whether the controller has hard output constraints or hard mixed input/output constraints, and if so, whether these constraints may become impossible to satisfy at run time. Soft Constraints Test whether the controller has the proper balance of hard and soft constraints by evaluating the constraint ECR parameters. Memory Size for MPC Data Estimate the memory size required by the controller at run time. review automates certain tests that you can perform at the command line. To test for steady-state tracking errors, use cloffset. To test the internal stability of a controller, check the eigenvalues of the mpc object. Convert the mpc object to a state-space model using ss, and call isstable.